Why does the calculation take a long time after changing the surface rigidities in "membrane-free"? How are these calculated? With the property "Membranzugftrei" the model is calculated completely nonlinear. The program initially sets 5 load levels automatically (see Figure 1) for better convergence. The area is first considered in the calculation as an isotropic material with the compressive elastic modulus of the defined material. 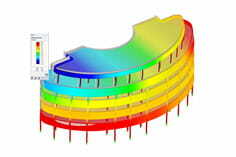 In the first iteration, which is a normal linear calculation, the mean stress state is determined in each finite element. The voltage is transformed in each element in the direction of the main voltages. In each direction is checked whether train occurs. If so, or more specifically, if a certain threshold of deformation is exceeded, the corresponding coefficients of the stiffness matrix are reduced to 10%. Such an element then becomes an orthotropic element with the orthotropic directions identical to the directions of the principal stresses. For such a modified structure, another iteration is performed and step 3 is repeated. The stiffness reduction of the surface must not fall below a certain limit; this limit is on by default 1/1000 set. If in the iteration the sign changes to pressure in one of the directions, the material rigidity in this direction is increased again. However, the initial stiffness must not be exceeded. The iteration stops when a stiffness change no longer needs to be made in any element or when the user-defined maximum number of iterations has been reached. It often happens that the sign of the normal voltage in an element reverses periodically. Then it is expected to reach the maximum number of iterations. In this case, some elements may also experience higher tensile stress, but the global stiffness of the surface will not be significantly affected. The bending stiffness is not affected.